Constructed in 1967 as Toronto’s Centennial Project, the St. Lawrence Centre for the Arts (StLC) opened its doors in 1970. The building housed two theatres: The Theatres and The Town Hall. The early eighties saw The Theatre renovated with the generous support of the late Mrs. Bluma Appel, a major patron of the arts. It was renamed in her honour. In 1984, a group of friends of the late Canadian actress Jane Mallett organized a fundraising campaign to renovate the Town Hall, renaming it the Jane Mallett Theatre to commemorate her life and accomplishments. In November 2007, at the end of a year-long $3 million renovation project, the StLC revealed a new, modern look to the public. The undertaking coincided with transformations of other cultural landmarks in Toronto including the ROM, the AGO, the National Ballet School, and the Royal Conservatory of Music. In 2015, Toronto's City Council approved the consolidation of the governance and operations of the St. Lawrence Centre for the Arts, Toronto Centre for the Arts, and the Sony Centre for the Performing Arts into one new organization under the direction of a City appointed board called Civic Theatres Toronto. Located two blocks east of Union Station in downtown Toronto, the St. Lawrence Centre for the Arts is readily accessible by public transit and there are many surrounding parking lots as well. 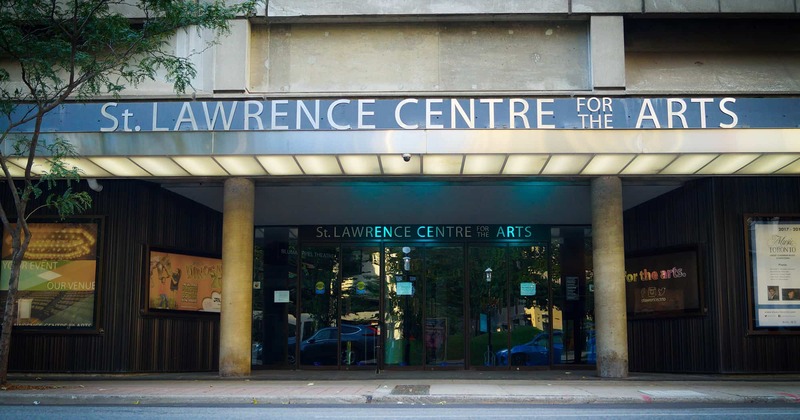 The St. Lawrence Centre is host venue for performances by Music Toronto, Toronto Operetta Theatre, Canadian Stage and many additional renowned Toronto arts and performance companies.